A green jacket is a popular item in sports memorabilia, but rarely does one escape the confines of Augusta National. Even rarer is the situation where one sits courtside at a New York Knicks game, but exactly that happened about one year ago. Fresh off his first major victory, Patrick Reed was courtside in his new hunter green jacket last May. It quickly made him stand out. 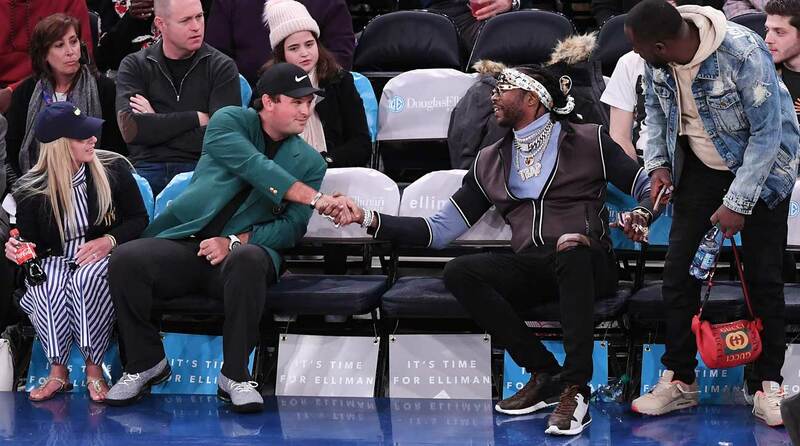 Patrick Reed and his wife, Justine, greet rapper 2 Chainz during a Knicks game last Spring. Reed certainly made the most of public appearances with the jacket; perhaps more than any other recent champion. Other than posing with chart-topping musical artists for a photo, Reed was also seen with the green jacket at a Houston Rockets game, a Houston Astros game, and even at a Chik-Fil-A drive through. Can you blame him, though? Reed is just playing by the rules here. Sergio Garcia wore his green jacket to El Clasico for his opening kick, and Jordan Spieth wore his while presenting a prize at the ACM awards. Unless he plans on winning again this year, Patrick Reed’s time to wear the green jacket in public is running out.